When I went to visit her land, Elizabeth Moon pointed out an owlfly to me. But it was far away and I couldn't see it very well. I looked up some pictures when I got home. 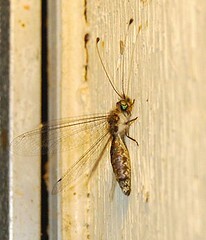 A couple of nights ago, I saw my first owlfly close up and in person. It was hunting for bugs by the porch light at my rent house. Owlflies could be mistaken for dragonflies if you're not paying attention. They are in the order Neuroptera, like lacewings and dobsonflies.